We have come across a fantastic new cordless powerhead that will give you deep cleaning without the need for electric power. Residential homes can use the Ascendent with central vacuums, either standard systems with non-electric hoses or Hide-A-Hose, as well as with canisters with non-electric hoses. 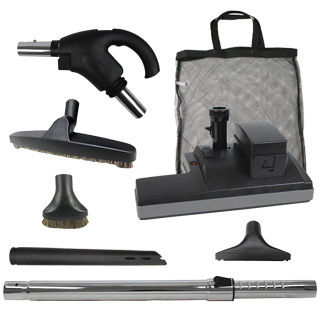 Commercial cleaners can use the Ascendent with canisters with non-electric hoses and backpack vacuums. First, let’s talk about the Ascendent and what it can do. The cordless battery powered powerhead will run for 1 hour and can be fully charged in just over an hour. 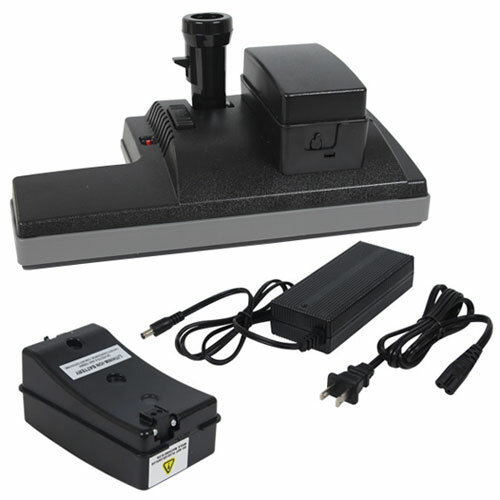 The on/off switch is located on top of the powerhead and can easily be activated by foot. The powerhead uses a standard 1 ¼” wand and has oversized rear wheels which allows it to glide easily across carpet and rugs. The Chevron wood agitator brush directs the dirt from the outside edges to the center where it is sucked into the hose. This helps to give the powerhead the deep cleaning capability of an electric powerhead without the need for an electric hose and inlets. A poly V belt resists stretching and breaking. The winged shape of the Ascendant helps maneuver around furniture and also comes with a wraparound bumper to protect furniture from scratches and dents. Second, the Ascendent is a great upgrade to a central vacuum system. If a homeowner has low voltage inlets and an electric powerhead, there needs to be an electric outlet within 6 ft of the vacuum inlet. Many times, the electric outlet is blocked by furniture making it difficult to reach the plug without having to move the furniture. With the Ascendent, the power comes directly from the powerhead so the user does not need to plug in a separate electric cord. If a homeowner has a Hide-A-Hose retractable hose system, the Ascendent is a great upgrade over an air-driven powerhead that is typically included with these systems. 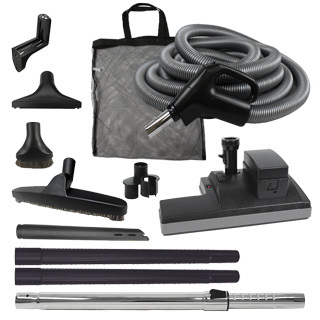 We created 3 specialty kits which include the Ascendent powerhead along with other specialty tools to make cleaning a breeze. The Ascendent can also be used with a canister style vacuum that has an air-driven powerhead or only suction tools. The Ascendent will fit any brand that uses a 1 1/4” wand. Please visit our website at https://qualityhomesystems.com for more information and to place an order. You can call us at 1-800-533-3249.